It’s time for another Holiday Gift Guide! I’ve covered gift ideas for the hostess, the man in your life and the fashion minded mom. Now it’s time to focus on the little people in your life – kids! I have some fantastic toys, games and sports equipment to share with you today. Some of these products you may have never heard of and I’m excited to introduce you to them. 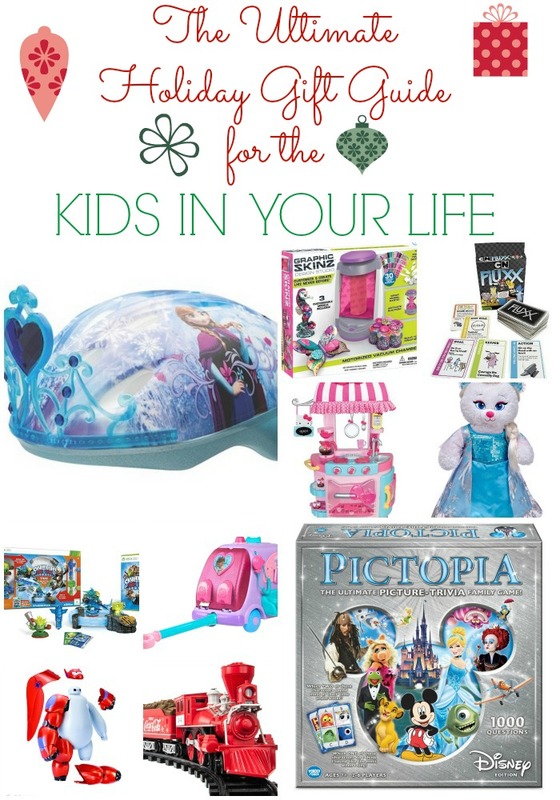 Others are probably on your kids’ wish lists already (like anything related to Frozen toys!). Enjoy browsing through and if you have a question about any of these items, let me know! 1. Bell 3D Helmets – Does your child have a scooter, bike or skateboard on their wish list? Kids all over will be opening these on Christmas morning and will be so excited to take them for a spin. What better way to make sure they’re safe and protected while on their new wheels than by gifting them a new helmet? Do I ever have THE helmet your kids will love! It can be difficult to get your kids to wear helmets (I’m speaking from experience with two boys who longboard), but these one-of-a-kind 3D helmets from Bell are so awesome your kids will actually want to wear them. Kids will love the unique 3D design with the characters they love (from Disney and Marvel) and parents will be happy with the safety aspect and not having to fight with them to wear a helmet! I can tell you firsthand that the Frozen helmet and Spiderman helmet are so cool. They also have Disney Princess and Minnie Mouse helmets. Give the gift of safety in a fun way this Holiday season. The Bell 3D Helmets are available at Walmart, Target and Toys R Us. 2. Graphic Skinz Design Studio – For those kids who love to craft and make things, the Graphic Skinz Design Studio is unique and well, down-right fun. I know because I have one and love it! Kids can make some amazing and fun creations by “skinning” objects from home. With the super suction vacuum chamber, they can apply a skin to toys, models, cell phone cases, jewelry and just about anything that fits into the chamber. Not only can kids customize their own items, but they can make one-of-a-kind gifts for their teachers, friends and family members. I had a blast “skinning” some items, which I’ll show you over on my party blog next week! 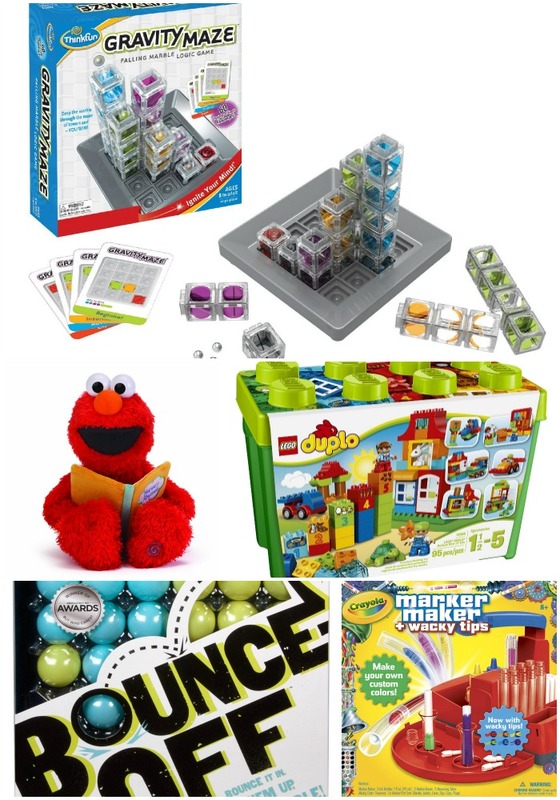 The design studio is available at Amazon, Walmart, Target ,Toys R Us, Meijer and Kohls. There’s also one geared towards boys where they can customize monster trucks, spiders and a shark which are already included in the kit. 3. Cartoon Network Fluxx Card Game – Does your child love Cartoon Network? This card game is geared towards the older kids. The Cartoon Network Card game includes some of their favorite characters from the network’s hit original series including Adventure Time, The Amazing World of Gumball, Courage the Cowardly Dog, Dexter’s Laboratory, Ed, Edd ‘n Eddy, Johnny Bravo, The Powerpuff Girls and Samurai Jack. It’s a fun game and one you can get in on the action with them. Give your kids the gift of a game featuring their favorite characters and your time as you play it with them! 4. Hello Kitty Kitchen Café – Did you know Hello Kitty celebrated her 40th anniversary this year? How cute is this Hello Kitty Kitchen Cafe? Your Hello Kitty fan can create yummy creations in their very own kitchen, complete with a real fabric awning and loads of accessories such as a “disappearing coffee” pot, coffee mug, two cupcakes and serving tray, removable oven rack, saucepan, spoon, two ice cubes, a pretend smart phone and a printed menu – whew! – just to name a few. They can also dispense “ice” from the ice maker and “cook” things on the stove, which features lights and a sizzle sound. 5. Frozen Characters from Build-a-Bear – When I first saw these Frozen characters from Build-a-Bear, I wanted all of them! You can choose from Elsa, Anna or Olaf and the accessories to pick from are incredible. There are even wigs for Ann and Elsa! See the entire collection here. 6. Skylanders Trap Team Starter Pack – My youngest son has had more fun playing this video game than I’ve ever seen him play before. Whether your child is a Skylanders fan or not, the Skylanders Trap Team brings loads of fun, game play technique and of course – trapping! The game features a new Traptanium Portal that brings the Skylanders to life. The goal is to defeat and capture villains in the Traps and then use the villains on the side of good. 7. Disney Doc McStuffins Get Better Talking Mobile – Doc McStuffins is on the go to make you feel better in her mobile cart. Your kids can pretend and bring care-on-the-go with the light & sound EKG, stethoscope and thermometer. Does someone have a boo boo? No worries! They can fix them with the bandage sticker dispenser. 8. Big Hero 6 Toys – Have you seen Disney’s Big Hero 6 movie? This is definitely one of my favorite movies for 2014 and possibly in my top 10 favorite movies ever. My kids and I laughed so hard during this movie! Not only was it funny, but extremely touching and had a unique story line I think kids can relate to. One of loss and forgiveness. I highly recommend it! There’s a fun line of Big Hero 6 Toys you can take a look at here. 9. Lionel Trains Coca-Cola Holiday G-Gauge Train Set – New for 2014, Lionel introduced the Coca-Cola Holiday G-Gauge Set. It’s been a huge hit and will be something that will brings hours of endless play. Not to mention how fun this will be to pull out every Christmas and put it under the tree. I’ve always wanted a working train set under the tree! The train set is designed in the iconic Coca-Cola style and will inspire family traditions and happiness for years to come. 10. Pictopia-Family Trivia Game: Disney Edition – If your kids are Disney fans and love to play family board games, here’s a fun one! It’s Pictopia Family Trivia Game: Disney Edition. Players answer trivia questions based on favorite characters such as Mickey Mouse, Cinderella, Jack Sparrow, Buzz Lightyear, and Elsa from Frozen. It’s a game of teamwork–with a competitive twist! Along the way, are guess-my-answer questions that reveal how much you know about the other players! 11. Gravity Maze – My son loves marbles and anything, including a logic puzzle, is something he can really get into and enjoy. Gravity Maze has 60 challenges ranging from beginner to expert and includes 1 game grid, 60 challenge cards, 9 towers, 1 target piece, 3 marbles. Challenge your kids to put their reasoning skills to the test. 12. Gund Nursery Rhyme Elmo – Oh how I love Elmo, don’t you? Or maybe you have an Elmo crazed little one in your home. The Nursery Rhyme Elmo recites 5 classic nursery rhymes, and his head, mouth, and body move along to the stories. I can just picture kids placing Elmo by their bed and enjoying nursery rhymes as they fall asleep. 13. LEGO DUPLO My First Deluxe Box of Fun – There’s nothing like your first box of LEGOS, and these DUPLO My First Deluxe Box of Fun are perfect for those who are just getting into them and aren’t quite ready for the smaller LEGOS. This set includes 2 LEGO DUPLO figures, turtle, rabbit, wagon base, 2 window elements, a door element, numbered bricks and a wide selection of classic LEGO DUPLO bricks. 14. Bounce Off Game – Mattel’s Bounce Off Game is the ultimate head to head battle. Players race to recreate the pattern on the challenge card by bouncing balls into the grid. The first color to complete the pattern wins the card. After you get 3 cards, you win the game! It’s for 2 to 4 players and includes 9 challenge cards, 16 balls and a game grid. 15. Crayola Marker Maker Wacky Tips – I had a chance to make my own Crayola marker with their Marker Maker Set at the NY Toy Fair. I instantly knew kids would love this. They can create their own colors and artwork with cool designs and funky patterns using the set of wacky tips. With the set, they can make up to 16 markers and includes three ink bottles, two marker boxes, two measuring tubes, a mixing chart, tweezers, and enough parts to make 16 one-of-a-kind markers.